ISLAMABAD: Pakistan will confer its highest civilian honour on the Saudi crown prince yesterday, a day after he signed investment deals worth 20 billion on the first stop of an Asian tour clouded by his alleged role in the grisly murder of a dissident journalist. 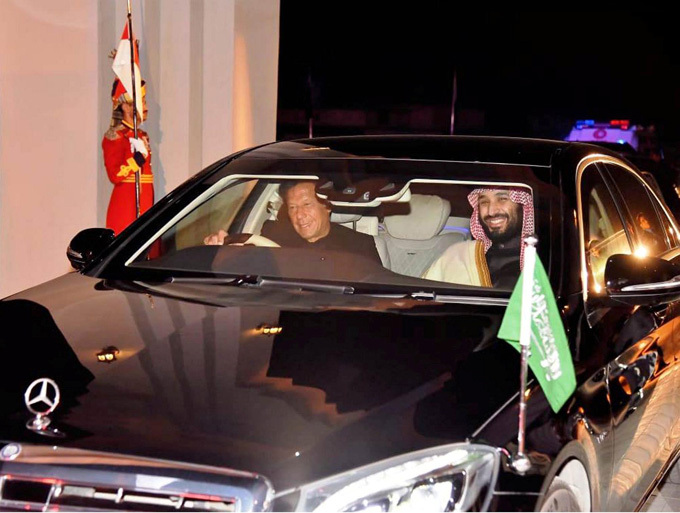 President Arif Alvi will award Mohammad bin Salman the Nishan-e-Pakistan (Order of Pakistan), the foreign office said in a statement, before the crown prince leaves the country for his next stop, Islamabad’s arch-rival India. Pakistan is facing a serious balance of payments crisis and hopes the huge deals signed over the two-day visit — seven separate agreements and memorandums of understanding — will boost its struggling economy. The tour coincides with a spike in regional tensions: India and Saudi Arabia’s arch-rival Iran — both bordering Pakistan — have accused Islamabad of backing militant groups which have carried out bloody suicide attacks on their soil in recent days. Hours ahead of the crown prince’s arrival Sunday, Pakistan dismissed Delhi’s accusations as ‘well-rehearsed tactics from (the) Indian playbook after such incidents in the past’. The crown prince, widely known as ‘MBS’, got a warm welcome in Pakistan, including a 21-gun salute and an honour guard. The Saudis, after initially denying any knowledge of Khashoggi’s disappearance, finally acknowledged that a team killed him inside the consulate, but described it as a rogue operation that did not involve the crown prince. Turkey said Friday it has not yet revealed all the information it has uncovered in the case, which launched a global wave of revulsion and tarnished the crown prince’s reputation.